Description: Numeric methods by the Newton-Raphson method. Three version, for a direct result, a step-by-step result, and a version in a table similar to Excel. 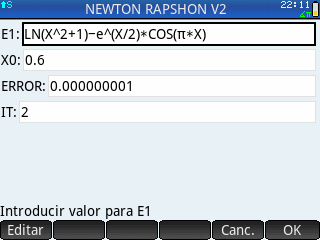 Description (2): Metodos numericos par Newton-Raphson. Tres versiones: version directa resultado, version paso a paso, y version en tabla en un Excel.